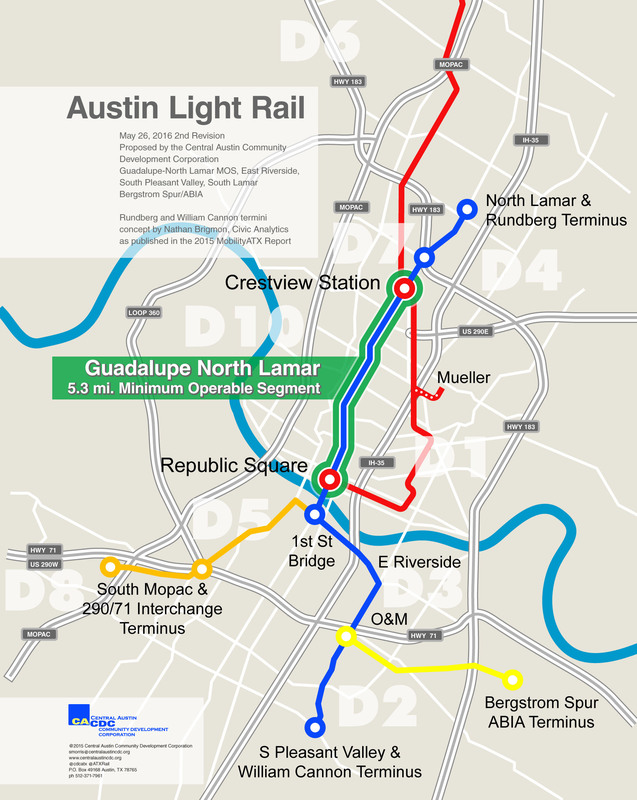 Since the winter of 2011, several local advocates of rail public transportation have been laying out a case for relocating the proposed Urban Rail line to serve the Lamar-Guadalupe corridor and UT West Campus rather than the official City of Austin (COA) plan for a line through the relatively sedate East Campus and eastward to the Mueller site. 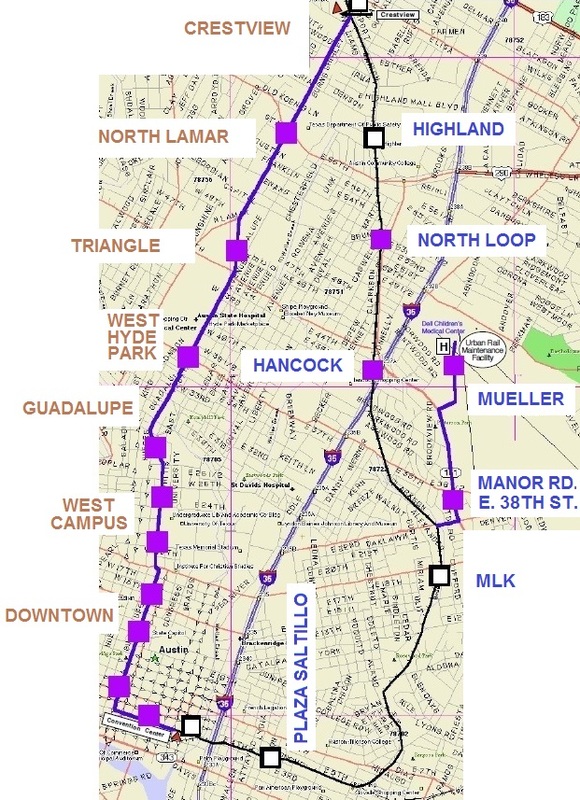 In a presentation to the Transit Working Group on 2 December 2011, including a handout, A Sensible, Workable Urban Rail Plan, Lyndon Henry emphasized the West Campus-Guadalupe-Lamar route from the central business district (CBD) to Crestview as a “Missing Link” in the official plans. This included the map excerpt shown above. The proposed Urban Rail “Missing Link” (using electric LRT) is shown in green. The red-and-white dashed line (with icons showing stations) indicates Capital Metro’s existing MetroRail DMU-operated Red Line. 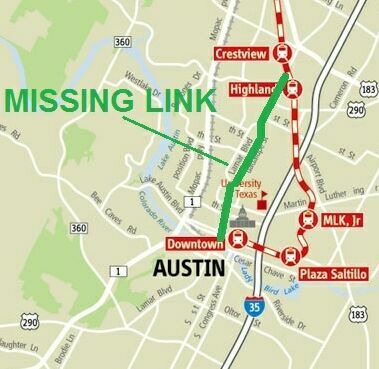 The Red Line, meandering through East Austin, bypasses the heart of the Core Area and the crucial Lamar-Guadalupe corridor — thus the need to install the “Missing Link” in that alignment. Lamar-Guadalupe is the primary local traffic corridor in central-city Austin, and any rail transit investment must serve this crucial corridor. Initially, this means a connection between the Crestview Red Line MetroRail station and the West Campus – in effect, a return to the route alignment under official study until mid-2003. In addition to serving this very heavy corridor, implementing the “Missing Link” add direct rail service between the northwest suburbs and Hyde Park, the Triangle, the UT campus, the dense West Campus area, the Capitol Complex, and downtown; provide UT with the critical connection it needs between the main central campus and the Pickle campus; eliminate the need for costly dedicated Connector bus service for MetroRail; and enable more cost-effective use of the current MetroRail DMU rolling stock (by shifting them to outlying service corridors). In addition, installing electric LRT service in this major corridor would increase total rail system ridership dramatically. Compare the original 2000 LRT plan with the COA’s deficient Urban Rail plan: In the original plan, a single LRT line, 14.6 miles, from McNeil to downtown (using the Red Line, then Lamar and Guadalupe) was projected to carry 32,100 daily trips in its first year! COA’s entire, 5-route system, 16.5 miles, is projected to carry just 27,600 trips in 2030. Why spend the better part of $2 billion (about 80% more) to get less? Splitting rail development between “Urban Rail” (City of Austin, COA) and MetroRail (Capital Metro, CMTA) is inefficient, wasteful, and reckless with taxpayer dollars. It’s essential for both COA and CMTA to move toward a technological integration of the two rail systems, on the basis of electric light rail transit (LRT, basically the Urban Rail technology). This would enable economies of scale, particularly in rolling stock procurement, and a number of other advantages, such as the better performance, environmental benefits, and cost advantages of electric propulsion. The current MetroRail DMUs could be deployed for service to more outlying corridors where extension of electrification would be less cost-effective. At the time, for a more immediate, affordable starter line, advocates were proposing a relatively short east-west line connecting the existing MetroRail station at the convention Center with the Seaholm development project and Amtrak station — referred to as a “No Nonsense” starter line. 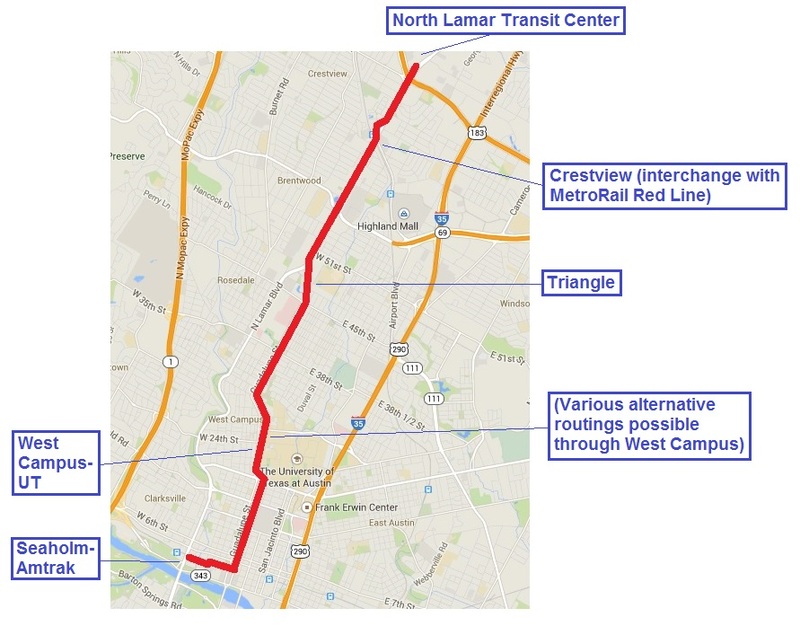 This alignment is still considered a viable additional route, but emphasis has shifted more to the Lamar-Guadalupe corridor and the proposed 14.7-mile Alternative Plan (including conversion of MetroRail to LRT between Crestview and downtown).